Once prepared, it’s best to enter your dog in a ribbon trial for practice. With all the attributes of a Championship show without the pressure, this is a good place to start. When you and your dog are confident, enter a Champ show. 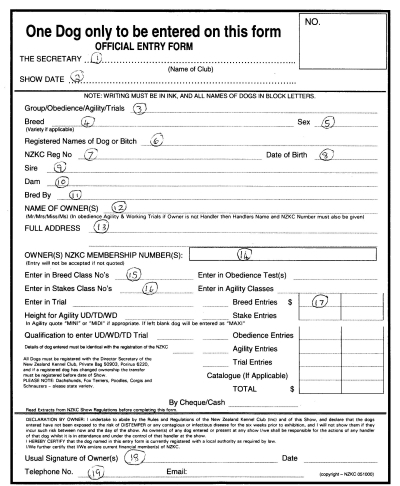 To enter a Championship show you must belong to the New Zealand Kennel Club. GRC Championship shows are listed on this website and as a member of the NZCK each month you will receive a Gazette which contains a listing of all the upcoming shows. Send in your entry before the due date and you are on your way. 18. In the case of a jointly owned dog only one signature is required but all NZKC membership numbers must be quoted.